Your exam day minute-by-minute. What to bring, how to prepare. Have you ever wanted to take a language exam with your best friend? With Euroexam, you can! Our spoken exams are conducted in pairs, and if you request it with your local centre, you will be able to take the spoken exam with your friend, or someone else you know. Do you prefer to have a dictionary to hand when you’re writing something important? Do you often check which preposition to use after ‘responsible’? Do you want to make sure you got the past tense of ‘become’ right when you write a letter? In Euroexam, you can! Wouldn’t it be good to have exams that are based on an internationally understood system? Exams that test your success in real communication? Where tasks reflect real world language needs? It certainly would and that’s why the Council of Europe decided to develop an international framework for languages that reflect what students, teachers and employers expect from language courses and exams today. The Spoken Exam has four tasks, which are similar to things you do in real life. You tell stories, argue, solve problems and communicate information to get things done. This collection of tips, suggestions and useful language will help you do well in the exam. The Spoken Exam at A2 level has four tasks. There are usually two candidates in the Spoken Exam, you and your partner. So, when we write "you" in these tips, it means that the same thing happens to the other candidate, too, or if we say "you give your presentation", it means that both of you do it, one after the other. If you are preparing for the Euroexams, have a look around here and you are sure to find the book that best fits your needs. 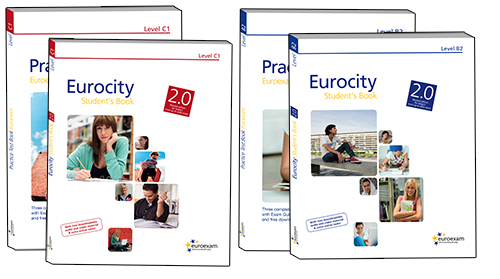 Use the Eurocity coursebooks and combine them with our testbook and the downloadable practice tests. Finally, use the 'Preparation tips' section to familiarise yourselves with our recommended practical exam tips and strategies. Euroexam is the right choice for you if you want an exam which is internationally recognised, and helps you develop real-life English skills. These communicative tests of everyday English standardised to the levels of the Common European Framework.